Sunday was unexpectedly not rainy so the family hopped into the car, stopped off for breakfast at Bella Bru, and headed for Fairytale Town. Click on the picture above for pictures from the day. Today, there was a special event at Fairytale Town and there was Taiko (Japanese) drumming. At the start of the year, we enrolled Megan in a hip hop/tap dance class on Saturdays. She attended during the month of January but we found that she was still too young to pay attention during the entire hour long class so we have pulled her out and will try again this summer. Emily, on the other hand, is continuing to go to hip hop dance class. 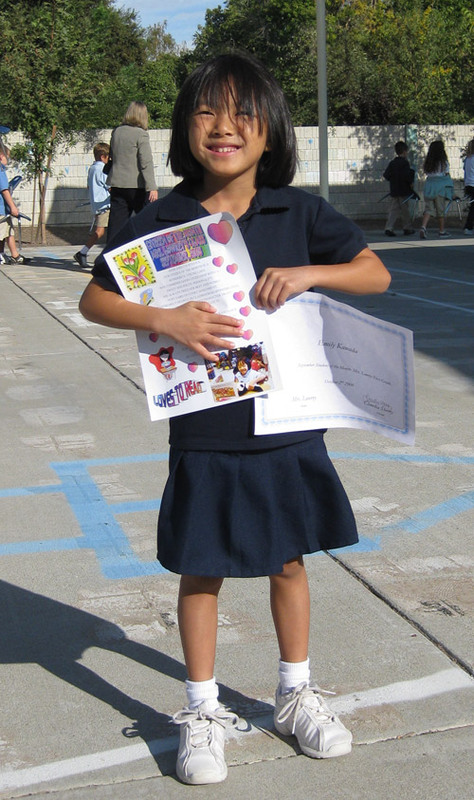 Emily has been attending continuously since the age of 3 and participates in dance shows at least twice a year. 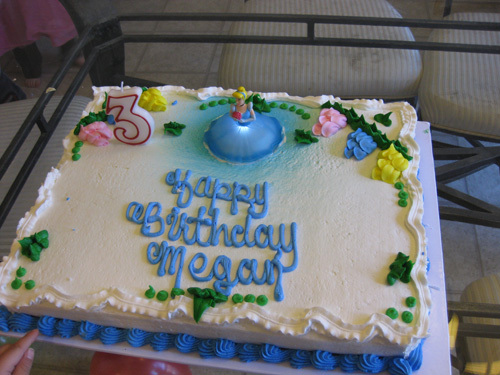 Megan had her 3 year old birthday party on February 7. The party was attended by 19 adults and 10 children. We fed everyone lunch (pizzas, sandwiches, fruits, veggies, chips), opened presents, and fed everyone again cake and ice cream. Before the party, Susan managed to snag for free an indoor bounce house that fit into our living room. So there were kids playing with toys upstairs in Megan’s and Emily’s bedrooms and there were kids downstairs in the bounce house. The girls have been talking about going to the snow. From here, it’s about a 3 hour drive. Neither of the girls have seen the snow. If we go, we’ll all need snow clothes since no one in the family has been to the snow in years. So we’ll need boots, thick jackets, etc. for everyone. At this point, if we went today, we’d be in jeans, cotton socks, athletic shoes, and medium weight jackets. Fortunately, it’s still snowing in the mountains so we still have time before the spring weather comes. 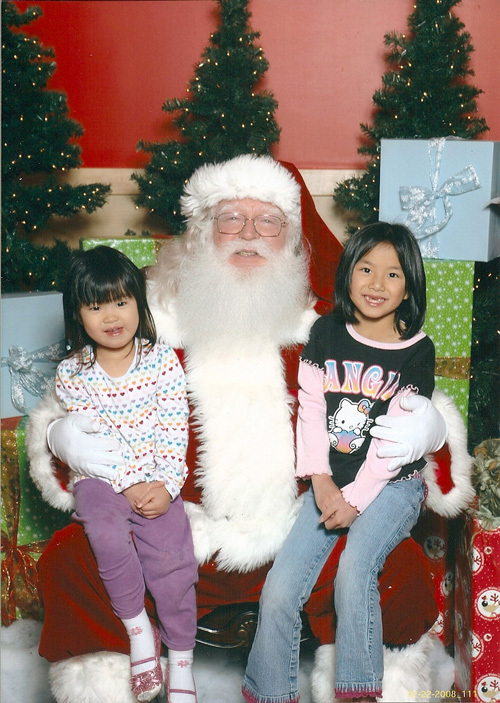 On Saturday, we’ll be at the annual Northern California Families with Children from China (FCC) Between Two New Years Party in Mill Valley (just north of San Francisco in Marin County). Due to, I believe, scheduling issues, this year’s party is not between the two new years days (American and Chinese). In fact, it’s after both new years days. For more information about the party, you can click on this link. Normally, the party is very well attended but the Mill Valley location is new (in the past it has been in San Francisco and Berkeley). Speakers on adoption/parenting topics for the adults. 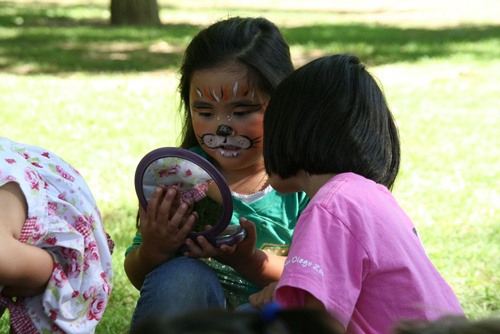 Arts & crafts, entertainment, and lion dancing for the kids. A light Chinese lunch buffet for all. 1 PM to 5 PM. For us, it’s a chance to meet up with fellow Chinese adoptive families we usually only get to see at this annual event. Here’s a link to pictures I took on my trip to Hollywood on October 15. I had a business meeting in Los Angeles on October 16 and took a vacation day so I could fly in a day early and play tourist. I walked along the Hollywood Walk of Fame (Hollywood Blvd) to check out all of the stars on the sidewalks, went to Grauman’s Chinese Theatre and looked at the footprints and handprints of the stars, and went to the Kodak Theatre (home of the Academy Awards show). Then in the evening, I was in the audience of Jimmy Kimmel Live. On Sunday, the family went to Nut Tree. Nut Tree is located approximately 30 miles west of Sacramento on the way to San Francisco. We started the day by going to Amici’s, which is located in the Nut Tree complex. Amici’s is a San Francisco Bay Area chain that specializes in New York style thin crust pizza. They also serves salads, sandwiches, and pastas. It was the first time we tried Amici’s and we’ll definitely be back. The pizzas and salad were excellent. They had a kid’s menu which had quite a few items Emily and Megan would eat. Next to Amici’s, there were retail spaces announcing a sushi restaurant and a Thai restaurant coming soon. After lunch, we walked to the theme park. 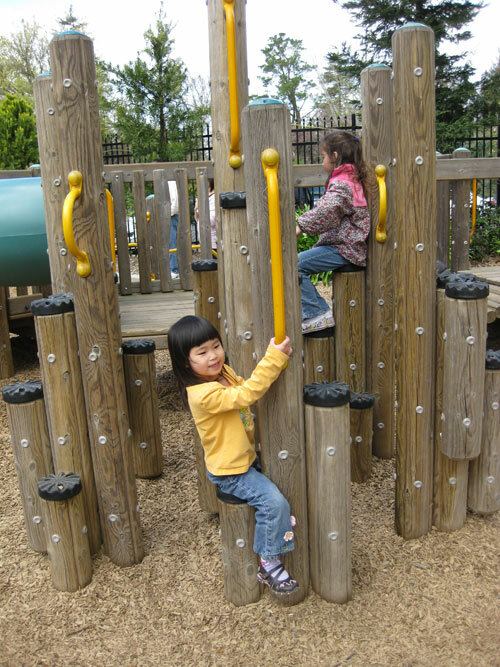 The Nut Tree is a collection of retail stores, restaurants, and a kid’s theme park. 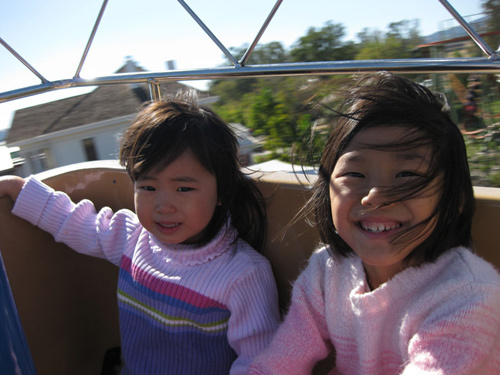 The theme park had a train, bumper cars, a rollercoaster, merry-go-round, and assorted other rides. Click on the picture below for additional pictures from the day. On September 27, our travel group from Megan’s adoption trip got together in William Land Park for a potluck picnic reunion. Actually, this was the Sacramento/Bay Area contingent (5 families) of our travel group. On Megan’s adoption trip, there were also three families from Southern California and two families from North Carolina. There were three additional Chinese adoption families who joined us as well. In all, there were 9 girls adopted from mainland China and one girl from Taiwan (along with their sisters and brothers). We ate a lot of food, the kids played together, and there was face painting. Many of the parents reminisced about our travel to China. Click on the picture below to see more pictures from the day. Click on the small version of each picture to see the full size version. Tonight I took the kids to Fandemonium, the annual preseason gathering of Sacramento Kings season ticket holders (no, I’m not a season ticket holder) at Arco Arena. On the concourse of Arco Arena, the Sacramento Kings has the Kings players and cheerleaders posing for pictures with the fans. Click on the picture above for more pictures from the night. Click on the small version of each picture to see the full size version.